From being a small child I have loved colour - be it coloured pencils, crayons, paper, wool or fabric. I have tried many crafts including sewing, embroidery, tatting, crochet, weaving & knitting. I used to borrow my aunts sewing machine when I was around 8 years old and I got my first 'modern' sewing machine ( A Singer with discs to make fancy stitches) when I was 10. I used to make clothes, soft furnishings and curtains and I would regularly return home from school to find my mother had bought material and would want me to make a new dress for her for the next day! Patchwork & Quilting started much later. My Singer machine is still going strong and I will never part with it. However around six years ago, my mother insisted on me having a new machine and she bought me a Janome 11000. 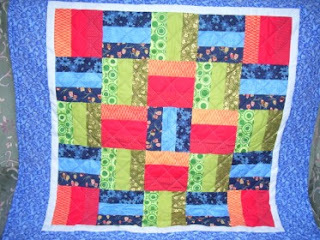 It came with the quilting kit and as I have never tried patchwork or quilting I decided that I really must give it ago. I followed the instructions in the book and I completed my first quilt. Ok, so the colours are not great and I knew nothing about lights & darks or small, med & large patterns and how to mix them, but that was it - I was hooked!